Bolchazy-Carducci: Latin for the New Millennium: Student Workbook, Level 1 - Teacher's Manual, 1st Ed. 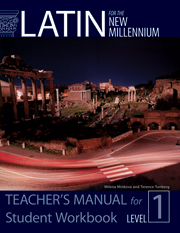 Latin for the New Millennium, Levels 1 and 2, Second Edition, will be available in 2017. For information on what’s new in the Second Edition, click here.